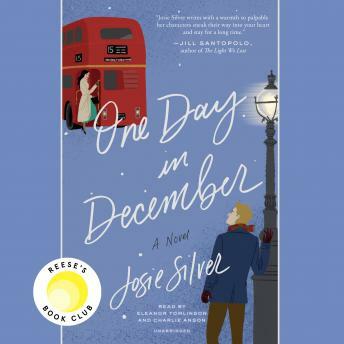 Listen to "One Day in December: A Novel" on your iOS and Android device. Certain they're fated to find each other again, Laurie spends a year scanning every bus stop and cafe in London for him. But she doesn't find him, not when it matters anyway. Instead they 'reunite' at a Christmas party, when her best friend Sarah giddily introduces her new boyfriend to Laurie. It's Jack, the man from the bus. It would be. This book was so fun to listen to. It was romantic and heartbreaking and funny at times. it was impossible not to get lost in the world of Lu and Jack and Sarah. Totally entertaining! I really looked forward to getting in my car to hear more and I almost hated to see it end. A little drawn out, but overall a lovely story. At times I had to adjust the volume of my car stereo to hear the narration; she did an excellent job but too soft spoken during some of the passages where the main character is reflective or expressing sadness. The male narrator was strong, used great inflection, and was believable as being the character he portrayed. I enjoyed listening to this and couldn’t sleep until I found out what happened in the end! Love, love, love! Eleanor Tomlinson’s narrating puts me in such a relaxing state and makes me crave for a glass of wine! The story is also very well written, I love evething about it. Perfection! Fun book. Narrators are outstanding! Didn’t love it, but did like it. Overall this is a book for teenagers and young adults.